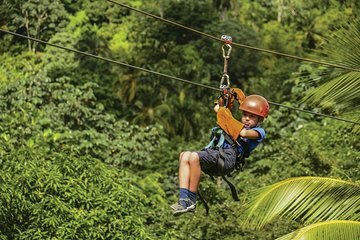 Fly through rainforest outside Punta Cana on a zipline adventure tour. With round-trip transportation from your resort to the Dominican Republic's Oriental Mountain Range, this tour gets you out in the wilderness without the hassle of renting a car. Zoom over 15 platforms and eight cable lines among the treetops and across open mountain valleys under the supervision of a guide. No experience necessary, all equipment and instruction included.